What is TESOL Italy’s mission? Its mission is to develop the expertise of those involved in teaching English to speakers of other languages and to foster professional growth and active participation in language teaching. This includes promoting community understanding of the role of language in a progressively changing environment while respecting individual language rights. Who does TESOL Italy collaborate with? ANILS, LEND, AISPI, ADILT, etc. What kind of professional development activities does it offer teachers? also start or join a local group anywhere in Italy. What exactly are local groups? professional development activities in their areas. Existing groups are located in Benevento, Bologna, Formia, L’Aquila, Marche, Messina, Napoli, Palermo, Roma, Val d’Adige, and Venezia. What is the annual National Convention? This two-day convention hosts over 50 talks, workshops and poster sessions given by national and international experts in the field of ELT. The book and educational material exhibition offers the latest in ELT materials and software, as well as information regarding study abroad programs. The convention offers a wonderful opportunity for professional development and networking. It’s a must for all EFL teachers in Italy. All convention participants become TESOL Italy members. Membership is annual and begins on January 1st and ends on December 31st. If this is your first TESOL Italy convention, your membership dues will cover one solar year. Call our office, send us an e-mail, or look on our website. 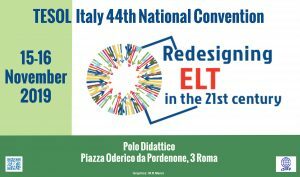 Teachers who cannot attend the convention but who would still like to become TESOL Italy members can call our office in Rome (06-4764-2432), write us an email (tesolitaly@gmail.com), or visit our website (www.tesolitaly.org) for the exact procedure. € 65,00 – supporters, schools, universities, agencies (includes English Teaching Forum). What is the Sirio di Giuliomaria Award? This is an award that TESOL Italy confers once a year. The teacher is awarded TESOL Italy membership (including Convention dues and the subscription to the English Teaching Forum) for three years. By joining TESOL Italy you have access to a network of other ESL/EFL educators who share your same concerns and interests.